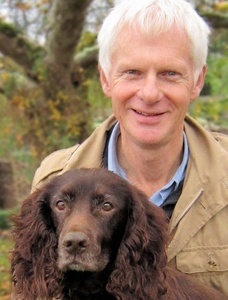 John Bradshaw, author of Dog Sense. I’m recommending two books for your summer reading list, and one of them I’ve never even held in my page-turning little paws. 1. Ignoring — that is, withholding attention from — your dog is the most effective way to send a message about unwanted behaviors (like jumping). Bradshaw doesn’t base this conclusion on moral distaste for physical punishment, choke collars, yelling, and the like — it’s what scientific research proves. 2. Dogs (with some exceptions) crave the company of humans. Spend time with your canine. But because not every aspect of your life involves Scruffy, teaching your dog to be comfortably alone is one of the greatest gifts you can give him. 3. None of these actions will be interpreted by your dog as “submissive” gestures on your part: Allowing your dog to win at tug-of-war, letting your dog walk through a doorway ahead of you, and (my personal favorite) permitting your dog to sleep in your bed with you. 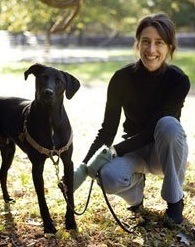 The second book is Alexandra Horowitz’s Inside of a Dog. It’s been on the New York Times best seller list for weeks, but I’ve just now gotten around to picking it up. If you are the least bit interested in how a dog’s mind works, read this fascinating book. Again, the concepts are grounded in research (Horowitz has a PhD in cognitive science), yet it reads like a lovingly crafted mystery. I dare say, it’s the best, most readable book on animal behavior since Temple Grandin’s Animals in Translation. 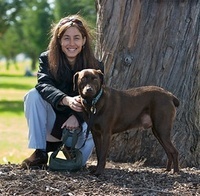 Alexandra Horowitz, author of Inside of a Dog. Leslie Smith (wishes she’d written Inside of a Dog).